While chipmunks can be very cute creatures, they can also cause a lot of damage to a lawn or garden and an infestation needs to be dealt with as quickly as possible. While there are many different poisons and toxins that will effectively kill off rodents, many people prefer to use natural methods as a safer and more humane way of handling the problem. Getting rid of chipmunks naturally takes some time, but is a viable alternative to pesticide extermination. Chpimunks are cute but they can be very destructive. Clean your yard. Chipmunks need shelter as well as food sources and keeping a well-groomed yard can prevent them from finding what they need to live there. Clean up any rocks, dried grasses, sticks or any other debris and make sure there isn't any trash or bird seed in the yard that can be used for food. Keep the grass short and trimmed to keep the chipmunks for finding shelter. Habitat modification can chase away chipmunks and prevent others from living there. Fasten hardware cloth to the base of your home and bury it eight inches under the ground to prevent chipmunks from burrowing under the house. Plant bulbs can be protected by wrapping them in hardware cloth before planting them. Set live traps if you are willing to relocate the chipmunks and there is not a wide infestation. They are more expensive than traditional rat traps, but are more humane in that the chipmunks will not be harmed. Use a natural repellent. 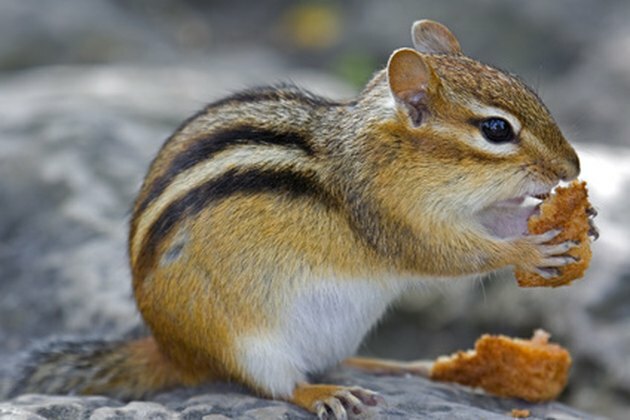 Chipmunk repellent mimics the scent of predator urine and indicates to the chipmunk that a predator is now living in that territory, making the chipmunks more likely to look for food and shelter elsewhere. Get a cat. If you are not concerned about the chipmunk's well-being, but still want to avoid chemicals, a cat can go hunting and get rid of the problem for you. Only use this method if you are willing and able to take care of the cat long-term after the chipmunk problem is gone.